This may be the best thing I have eaten in a week of good food. I want to call it Yowza Baby, but surely there’s a better name. This is based on a new-to-me technique for making purees. The instinct to make the frizzled scallions was my moment of genius for the month or maybe the year. I know it shows some steamed whole florets, but don’t bother. They are merely a distraction. In a pan, melt 2 or more tablespoons of butter in about 1 cm/1/4″ of water. The quantity should depend on the size of your cauliflower. Mine was small. Put the chopped cauliflower into the pan, add salt amounting to a ratio of 1 teaspoon per pound. I used about 1/2 teaspoon. Bring to a boil and simmer, covered, until it is quite soft, but not mushy. Check and add hot water if needed to keep the water at the original level. While it is cooking, slice a scallion very finely, then heat good oil in a small frying pan and toss the scallion into the oil, and then salt generously. Cook, tasting and correcting for salt, until just well caramelized and remove from the heat instantly. This is a condiment, so it must be well seasoned, remembering that butter here is salt free. If yours is not, then you should keep that in mind. When the cauliflower is well-cooked, put it and the cooking liquid into a blender. Add 2 tablespoons of butter. Whiz it up, stopping and scraping occasionally, until it is a silky puree, light and smooth. Spread the puree on a serving dish, then scatter the fried scallions over it, including the oil in which they cooked. Serve hot. This is very, very good vegetables! Eat it. It’s still full-on strawberry season, so it makes sense to have them for dessert while they are still all that they should be. There are so many delicious ways to serve them, simple, elaborate, country style, sophisticated metropolitan style. I pulled out an old Italian friend yesterday. Oddly, although I have a special pan for making zabaglione in frightening quantities, and I brought it nack to Italy with me ten years ago, and although I made it often enough in the United States, I hadn’t made it even once in this Italian kitchen. That seems strange. Zabaglione (pronounced dzah-bahl-lyoh-nay) is a standard recipe you don’t need to mess with. It has three ingredients and stretches and shrinks as easily an anything I have ever seen. The recipe is expressed in a ratio and that ratio works every time exactly the same. It’s cooked over simmering water in a double boiler/bain marie/bagno maria. You can make it well ahead and cool then chill it, or you can like I did make it last moment and chill it quickly over ice water. This is what I made for two servings. 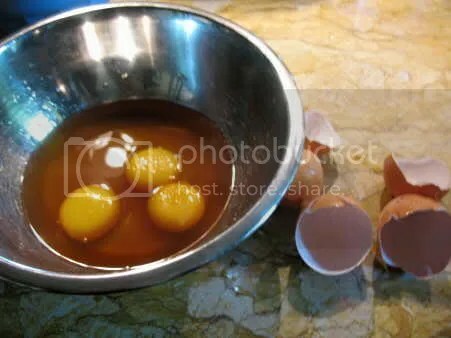 That is three egg yolks, three level tablespoons of sugar, and six level tablespoons of Marsala wine. It happens that Marsala is quite cheap here, but I find it very useful in the kitchen and I would keep it around even if it cost twice as much, which it may where you live. It is a fortified wine, so it will literally last generations if you don’t get around to using it up, but if you use it the way you might ordinarily use sherry, it will soon disappear. So that’s the ratio: 1 egg yolk, 1 level tablespoon of sugar and 2 level tablespoons of Marsala. Once memorized, you will be able to pull up in Mongolia and make Zabaglione for 2 or 200. 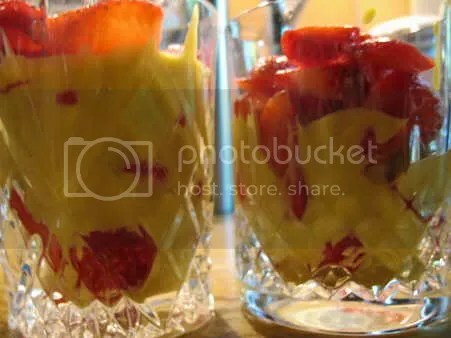 It’s very useful with stale cake, all fruits pretty much– well, maybe not watermelon– brownies, fruit tarts, use your imagination. Just put all the ingredients in a heatproof bowl, whisk them together, then put the bowl over simmering water and whisk continually for 10 to 15 minutes until the sauce is heated all the way through and is slightly thickened. It will never be firm like a pudding, because it has only yolks in it, but then it’s served over, under or inside things. When mine was cooked, I threw out the simmering water and replaced it with a tray of ice cubes and water in the same pan. I whisked the Zabaglione over that until it was room temperature. I had cleaned and sliced strawberries first thing in the morning and then left them to macerate a bit with some sugar at room temperature. The dish was well covered so as not to attract ants which always come with the berries. 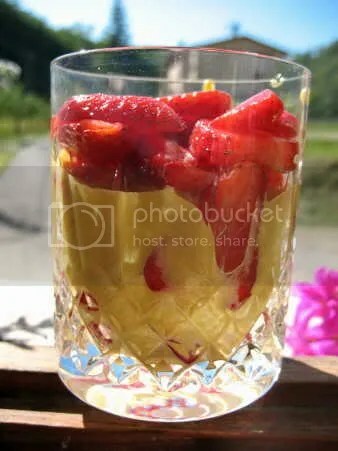 When I was ready to serve, I took two old fashioned glasses of deeply cut crystal and spooned them one-third full of berries. I divided the Zabaglione between the two then added more berries for color. We ate them while sitting on the river bank watching Max fish. Remember Max? He’s back! How does that look for a springtime dish? It’s the kind of thing that is better than anything else when asparagus is in season near to you. Like most things, miles traveled and the time it takes means something with asparagus, and ours locally has just come in season. There’s almost nothing you can do to screw it up except overcook it. There are lots of ways I like it and will eat it over the next few weeks, but my first time I like to eat it with Hollandaise. Let it be said that I do know how to make Hollandaise in the classic haute cuisine manner, but in my life there is also room for the quick and dirty if it tastes really good and doesn’t poison you. This tastes really good and is fast and easy. While it may contain more butter than your mother would like you to eat, when it comes to asparagus a lot of butter is pretty much going to happen unless you make a salad or something Asian, so what the heck? Use a double boiler or a metal bowl over simmering water in a sauce pan. 4 ounces/113 g butter cut in pieces. Just put all that into the appropriate vessel and start whisking it, paying attention to the edges, where the cooking will start. At first it seems like nothing is happening, but then it starts to coat the vessel. Whisk continuously. As you see evidence that it is thickening, use a teaspoon to gather a drop and taste for salt. Correct that. When the whisk starts to leave tracks, remove from the heat source, ergo lift the bowl or upper part off the hot water. 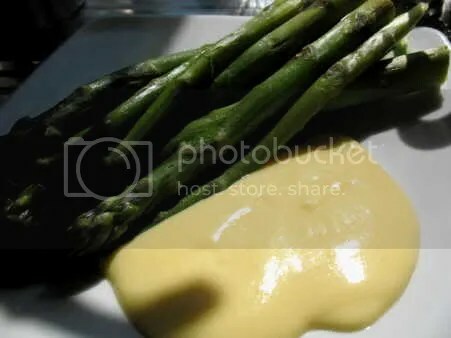 Serve hot or warm with asparagus or a legion of other dishes. Once you get this into your head, you’ll be able to do it without even paying attention. It’s exactly the same as making lemon curd, except it doesn’t need to be chilled. Refrigerate any leftovers, and I believe you can reheat it in a microwave on low power, but I have no way to check that. Saturday, when I shopped for groceries, there was a sale on speck, which is Italian smoked ham from the Alps. I’d forgotten how delicious it is. It’s not quite like any other ham I’ve ever tasted, and nothing like prosciutto crudo except in looks. You could easily mistake one for the other. I found that its nutty, slightly smoky flavor made spring jump in through my kitchen window, just like that brilliant sun. Need I tell you how glad I am for that sun? We’ve had four small earth tremors this week, but not a single volcano eruption. That is good. So is asparagus. In un bagno maria mettete tutto. Con la frusta mescolate in continuo, fate attenzione particulare ai bordi, dove cuoche prima. Quando inizia la cottura, assaggiate e correggiate il sale. 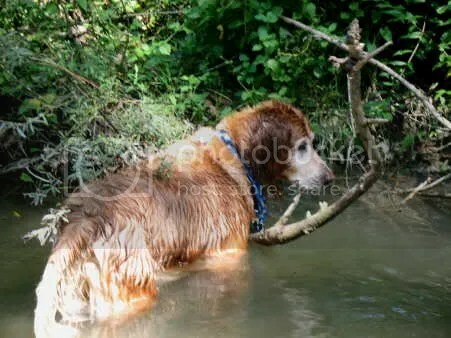 Quando la frusta lascia tracce, togliete la salsa dalla fonte di calore. Servitela calda o tiepida. La Salsa Olandesa è una salsa madre della cucina alta, ma questa versione è più veloce che quella classica. Vi serve per gli asparagi ed anche altre verdure. So many people say they hate anchovies. I used to say it too. The same goes for sardines. I used to shudder watching my father dig them out of a flat tin and joyfully munch them down on toast. Then I started traveling to Italy and I discovered that I do not hate anchovies or sardines, I just hate eating tinned ones. I can cook with them and get fabulous dishes, but for the most part I do not want to meet them alone in the dark. Fresh ones are a completely different thing. In Italy they are called pesce azzuro, or blue fish, which category food experts have declared for all the cheap fish that have a lot of omega 3 in them. They plead with us to choose these fish first for many reasons. They are also very much overlooked and underappreciated in the United States to the point of being hard to find except in ethnic markets. 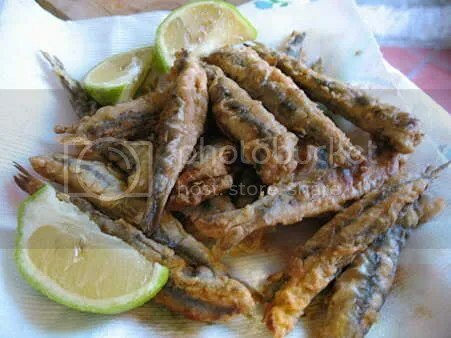 And yet, the first time I ate a fried anchovy I lost my heart to the little thing. I was at a beach house and the host had ordered a fritto misto carry out from a nearby restaurant. I secretly thought I could eat just the shrimp. Then I accidently bit into a tiny fish and the earth moved. I know I have used a lot of romantic imagery in this paragraph, but I have a lot of it in my head and at my age one mostly gets to apply it to food. These ones you see were cooked as part of an extended lunch antipasto in Ostuni, Puglia. They were incredibly fresh, bright-eyed, shiny. I wouldn’t buy them if they were any other way. Many cook them just as they come, but I like to behead them and remove the innards, of which there is very little. Just running your finger along the side of the fish removes it. Wash under running water, then lay on paper towels. They will cook in minutes. Almost anything I say about anchovies/aciugi/alici I can also say abouyt sardines/sardi, but being a bit bigger they will take a bit longer to cook. First flour the fish, then drop them in the egg wash then dredge them once more in the flour mixture. Heat a generous amount of oil in a frying pam. It should be between 1/8 and 1/4 inch deep, or .5 to 1 cm. When the oil is moking, lay the fish in it and fry a few minutes, then turn and fry the other side. They will cook through in moments, and in the case of anchovies, the bones will disappear. Remove them as they are done to paper towels to drain them. Serve with lemon if you like. As you can see I did, but I actually never use lemon on them, because they have such a perfect nutty taste that I don’t want to alter it at all. If you find sardines instead of anchovies, they can be split and cooked butterflied, or if not it’s nice to open them after cooking and gently remove the spine, carrying wth it most of the bones. There are lots of things you can do with these two small fish, but this way of cooking them seems to be universally a favorite. Leek Pasta: who loves ya baby? If you eat alone often, it’s easy to get careless with how you eat. Eating at the computer? Guilty. Eating at the TV? Guilty. Eating while reading a magazine? Guilty. Which of us doesn’t know that’s not a good idea? I mean, if we care enough about food to select the best ingredients, seek out great recipes and cook them with care, why wouldn’t we care about how we eat them? When we serve a meal to friends, don’t we make place settings at the table, get out a cute tablecloth or placemats and use clean glasses? Is that only because we are honoring the food or are we honoring the friend? Or both? I think for me it is definitely both. 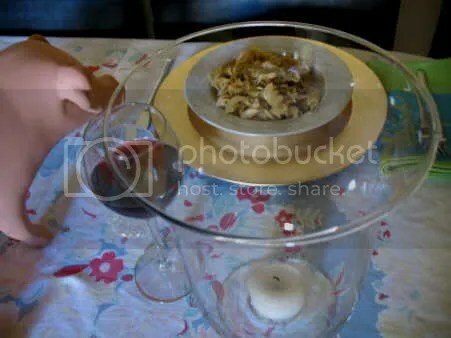 I would never dish up a bowl of pasta and hand it to a friend saying, “Here. Go eat it wherever you like. You’ll find a fork in the drawer.” So why do I feed myself that way? I can’t diet because I don’t care enough about myself to do it for me. I have to be very self centered to dedicate all that attention to such a thing. But I think less of myself because I am overweight ever since I quit smoking and I am afraid the weight is starting to feel right at home. I’ve even developed several weight induced health problems and I still was only able to diet long enough to lose 5 pounds. Crap. So today I decided to start treating myself like someone special in hopes I can be hoodwinked into believing it. I made a dish I like a lot. I set the table the way I would for anyone else in the world. I opened a bottle of wine– the first since I returned home on 29 September. 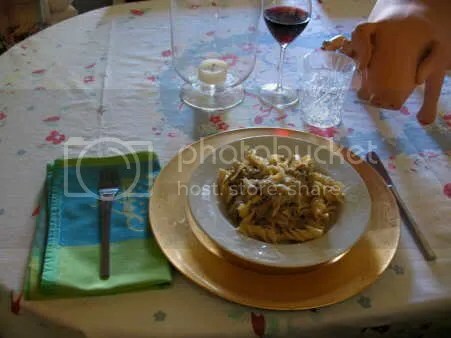 (I am not drowning my troubles in liquor; wine with meals is just normal and usual here.) Who is really your best friend forever? (Hint: it is not Marc Jacobs.) Be nice to yourself. 1+ ounce (30+ g) medium pecorino cheese, grated coarsely: medium pecorino cheese means not pecorino fresco nor one of the very fancy really aged ones, but just a normal sort of pecorino. I can’t recommend much of the pecorino romano I found in the US. Better to go to someplace where they let you taste what they have and select one that still has some butteriness, but also has some body. Begin by putting the pasta water on to boil. Slice the leeks about 1/8″ thick– that’s really thin. Heat a heavy frying pan big enough to hold the amount of pasta you are cooking, and when it is hot add the oil. Sauté the leeks, the red pepper and add a bit of salt. By now the pasta water ought to be boiling, so throw in the pasta and a small handful of salt. Stir the leeks around until they start becoming a bit browned, then add the cream. It will get quite thick very quickly. Ladle a bit of pasta water into it so that it is the consistency of thin cream, and add more later if necessary to keep it that way. Check for salt at some point. As soon as the pasta is done just to chewy, more than what you think is al dente, REALLY al dente, drain the pasta and toss it into the frying pan of sauce, then add the grated pecorino over and stir around briefly, maybe half a minute. Serve while smoking hot. Fresh ground black pepper might be nice. It’s not much. It’s just a different way of looking at the same things. This week, Presto Pasta Night is at “Eats Well with Others” which is an exceptionally nice title for a blog! Go see what she eats well. The challenge for this charity drive is to post about foods beginning or ending in O. That might be easier in Italian than in English, but I still didn’t find an instant solution. Tomato or pomodoro is a natural beccause it works in both languages, but it’s the end of the season and I haven’t done anything new with them. It’s not yet orange season, but those are arancie anyway. The fact is, most fruits and vegetables are feminine in Italian and therefore don’t end in O. It took a while to find a food in which every single ingredient works in at least one of the languages, and here it is. 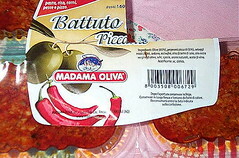 Spicy olive spread in English, battuta piquante d’ulive in Italian. It’s cheap, easy and delicious. It’s my effort to copy this purchased ingredient that I really like, but that is way too expensive. You can use a food processor, a min-chopper or a knife. If you want it to look redder, like the purchased version, you should blend the chillies with the oil a couple of days ahead, but be sure you refrigerate the resultant chili oil until you make the spread. You can combine the chillies and oil ahead of time as noted and in a couple of days the oil will be red and spicy. Warning: making your own chili oil can be dangerous and it must always be refrigerated! Or you can do it the way that resulted in this spread, which is to add the oil at the end. The brine used to cure the oilives makes the chili oil safe. Mince the drained olives roughly. These were pulsed in the food processor. Add the chili peppers and pulse again. Taste to see if it is spicy enough and adjust. Add the oil and mix well. Scrape into a glass container and refrigerate. I wouldn’t use plastic for a container, because I think plastic absorbs picklish flavors and spoils the next thing you put in there. In a few days it loses some of its heat, so you can spice it up to your taste again. You can use this on toast squares for a canape or antipasto, but I have found it most useful as an ingredient. It can be stirred into mayonnaise for a livelier tuna or potato salad, or spread on sandwich bread like mustard. A white sauce that tastes bland can be perked up with a spoonful or two of battuta. Try some in salad dressings, over mild vegetables, stirred into rice, in butter for a compound butter, in the milk when you are making a genuine macaroni and cheese. When I serve spicy cuisines like some southern Italian or Indian, I sometimes put tiny bowls of this battuta around as a condiment. This is so easy and cheap, I think every single one of you should make some—halve the recipe if you aren’t sure—and you should tell me what came to mind to do with it. After all I have an enormmous container of it in my fridge! When I bought it, it cost €2.95 for a packet of four tiny sections. That translates to almost US$4.50. This big jar full is about three times as much and cost me about €1, or US$1.50. If only I could pull this off with pork chops! You have nothing to lose and much to gain, so make some battuta for your fridge too, and donate to help fight ovarian cancer. Generations of girls and women will thank you for it. I will too.